The enchanting fairytale of a lovable wooden puppet who longs to be a real boy finally comes to life on DVD and digital platforms from May 25th, 2015, courtesy of Signature Entertainment and to celebrate we have a great competition for you and 2 copies on DVD to give away! 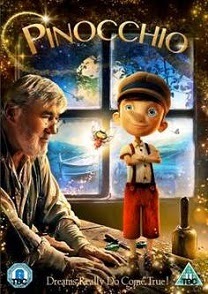 The elderly puppet maker Geppetto (Mario Adorf – A Christmoose Carol, The Secret of the Whales) wants nothing more than a son to call his own, and one beautiful, starry night, a fairy godmother fulfils his wish in the most unusual way imaginable. Using her powers, she transforms a marionette carved by Geppetto himself into life- the little wooden boy Pinocchio. Mischievous and stubborn, Pinocchio ignores the protestations of Coco, his little cricket companion, and takes off determined to explore the world and embark on an adventure. However, he soon finds himself having to face up to the dangers of the real world, including cruel puppeteer Mangiafuoco and the deceitful tricksters Cat (Florian Lukas – The Grand Budapest Hotel, Goodbye Lenin) and Fox (Sandra Huller – Requiem, Strings), as well as realizing his own dishonesty and selfishness may be the only things standing between him and the chance to be a real boy. Combining live action with CGI, this wonderfully charming, beautifully crafted adaptation of Carlo Collodi’s beloved book is teeming with memorable characters, remaining faithful to the original while injecting new life into the classic tale- sure to delight children and adults alike!